This site is a record of the research I have been doing, initially to produce a poster-display about the lives and war experiences of science fiction and fantasy writers during what the British used to call the Great War, what they subsequently called the First World War, and what (under American influence) is now often known as World War One, or WWI. For H.G. Wells in 1914, of course, it was “the war to end all wars”. This site was given the award for Best Non-Fiction of 2014 by the British Science Fiction Association. The announcement was made on 5 April 2015 at Dysprosium, the 2015 Eastercon. To see the list of writers I am dealing with, click on “The Writers” or “War Experiences” above: each writer has an entry under both of these categories. I am continuing to add people, though at a much slower rate than during the first half of 2014. Since moving away from London, it has become difficult to do more work on this (it really does require me being in the British Library), but I do intend, one of these days, to investigate Andre Arnyvelde, Oliver Ridsdale Baldwin (Martin Hussingtree), Victor Bayley (who wrote as Wayland Smith), Christopher Blayre, Alexander Bogdonov, Robert Sidney Bowen, Katherine Burdekin, Paul Busson, Blaise Cendrars, Howell Davies (who wrote as Andrew Marvell), Eric De Banzie (Gregory Baxter) Geoffrey Dennis, Alfred Doblin, Jefferson Farjeon, Harding Goulburn Giffard, Francis D. Grierson, Alan Griffiths, J.B.S. Haldane, John Hargrave, Julian Huxley, C.E. Jacomb, Storm Jameson, Horace Edwin Littlejohns, Ian MacDougall, William J. Makin, William Marston, Van Wyck Mason, Vivian Meik, Charles Morgan, Bernard Newman, Eric Partridge (James Ray), H.M. Raleigh, Owen Rutter, Jean-Toussaint Samat, Evelyn Sharp, Frank H. Shaw, Lance Sieveking, Stephen Southwold (Neil Bell), Alexander Maitland Stephen, Martin Swayne, Leo Szilard, A.A. Thomson, Ludwig Tügel, Max Valier, E. Charles Vivian, Frederick Watson, Farnsworth Wright, and Francis Brett Young. Most or all of these already have entries in the Encyclopedia of Science Fiction, mostly having been added to the site by John Clute in the years since my own site was created. Many thanks to John for all these names! 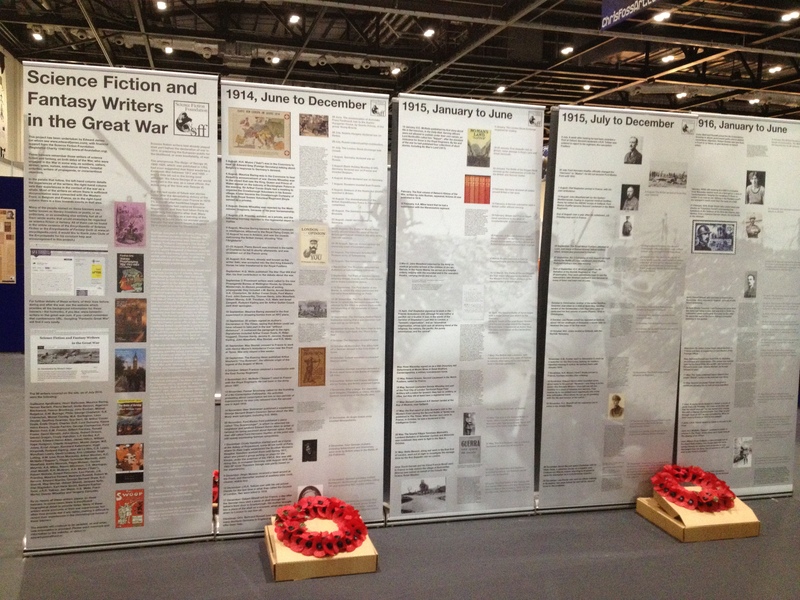 The banner-display (financially supported by a generous donation from the Science Fiction Foundation) was exhibited at Loncon3, the World Science Fiction Convention that took in London in August 2014, exactly one hundred years after Britain’s declaration of war; after that it will be on loan to anyone who would like to use it. The images on the banners, at reduced size, are on this website: click on “Banners” on the bar near the top of this page. This web-site will remain, as, if you like, the footnotes for the display, and it will continue to expand as long as I find more material to add. Apart from doing this site as a tribute to the founders of the type of writing I love most, I am finding it a fascinating insight into people’s lives during the years 1914 to 1918. These people may be linked by a specific type of literary imagination; but their experiences could not be more varied. Some of them, of course, got shot at in the trenches, and at least four of them—Émile Driant, Gerald Grogan, William Hope Hodgson and H.H. Munro—died there. But others flew planes, drove ambulances, nursed in hospitals, wrote propaganda, spied, or became conscientious objectors. Most of them lost friends, or family, or both. The Great War changed the lives of all of them, but in very different ways. This website is definitely about the people, and not about the fiction; in particularly, it is not about science fiction or fantasy set in the Great War. For an introduction to that, see the entry in the Encyclopedia of Science Fiction. At the moment most of my writers are British, largely because of the current state of my research. The writing of science fiction and fantasy was an activity that was as common in France in 1914 as it was in Britain. At one stage, back in March 2014, I was adding French names almost daily; but finding out information about them was not easy. There is no full and up-to-date reference work like the Oxford Dictionary of National Biography for France, and there seems often to be little information on-line. Jacques Spitz, for instance, I include solely because one scholar reports that he was active in both world wars; I have no other biographical information as yet, but I have included him on the basis of that one sentence. It was only after the Second World War that some writers would think of themselves as “science fiction writers” or “fantasy writers”, of course; many of these writers are better known now for other types of writing. To take two examples, Sir Arthur Conan Doyle and Rudyard Kipling each wrote important examples of both science fiction and fantasy, even if they are better known now for Sherlock Holmes and Kim; and they both, despite their age, played a part in the War. I shall deem a writer to be a writer of science fiction and/or fantasy if he or she has an entry in the print version of The Encyclopedia of Science Fiction (ed. John Clute and Peter Nicholls) (London: Orbit, 1993) or The Encyclopedia of Fantasy (ed. John Clute and John Grant) (London: Orbit, 1997), or in the online Encyclopedia of Science Fiction, which is being continually updated and enlarged (or the online Encyclopedia of Fantasy, which isn’t). But I am always hoping to find someone that John Clute hasn’t heard of, in order to get that person their rightful entry in Clute’s ever-expanding online text! (The other reference book I am using and am not giving full publishing data each time is Pierre Versins, Encyclopédie de l’utopie, des voyages extraordinaires et de la science-fiction, Lausanne: L’Age d’homme, 1972). Even if they do get an entry in Clute I am at the moment only including them if they had a direct personal involvement in the war: more direct than, say, the fact that Eleanor Farjeon lost her beloved Edward Thomas. I have excluded Aldous Huxley and Charles Williams, for instance, because their lives seem barely to have changed during the war. I acknowledge here that writers like C.S. Forester, Franz Kafka and P.G. Wodehouse did try to enlist in the military, but failed their physicals. John Buchan’s health and age were against him enlisting initially, but was involved in Intelligence from 1916 onwards, and so is included; I thought Winston S. Churchill‘s engagement with SF&F too slight to merit his inclusion. Finally, could I encourage anyone who finds this site to tell me if there are mistakes, or omissions. Thank you! Contact details and more information about me can be found here. Not only H. H. Munro. William Hope Hodgson springs to mind. Sure there are others. Thank you: it was only yesterday afternoon as I was reading through the Dictionary of National Biography that I realised I should have added Hodgson. But I think there are no others who died in the list as it now stands; but, of course, after searching the online DNB in various ways I have found a few more names to add: no more fatalities though, I think. From the Wikipedia article (and I know nothing about him beyond that) he would appear to be an early alternate history/mil-sf/what if writer. And sorry, while I hadn’t heard of Driant before, John Clute plainly had. http://www.sf-encyclopedia.com/entry/danrit_captain so the search continues. Given the scale of the French and German armies, I would be very surprised if there weren’t others that we would now consider SF/F, even if they might not have used the terms themselves. Clearly I am going to have to look more carefully through Clute, specifically for the non-English writers. Thank you so much for spotting this one! Perfect! Searching Sf – encyclopedia for “killed 1915” shows up two more for you. Ivar Campbell (1890-1916) wrote short fantasies collected posthumously in The Prose Writings of Ivar Campbell (1918). They include a Blackwoodian story (a first draft), “A Puzzling Affair”, about a young man who encounters an ominous natural force he calls Pan. The author died of wounds received in Mesopotamia on 8 January 1916. I wrote about him in Aklo, A Journal of the Fantastic, Autumn 1992, pp 11-14 and reprinted his ‘Pierrot’, ‘An Essay Upon Death’ and ‘Absinthe’. Thank you for establishing this fine project. Thank you so much for these two additions to the ever-growing list! Thanks for creating this site. A welcome intersection of two of my interests. Have you included W. A. Darlington, author of the comic fantasy, Alf’s Button? No, I didn’t know about that book. I have now read your blog on the topic, and clearly I must add it. (I loved your comment about Harold Hobson and Penelope Gilliat: I just read it out to my wife!). I shall certainly add Darlington, and acknowledge your help. Thanks very much! Does Arthur Ransome’s having written ‘The Elixir of Life’ and his role as a war correspondent in Russia (and possibly spy – disputed) gain him entry? Also, Eliot Crawshay-Williams wrote some short fiction of a fantastical nature and served in the Royal Horse Artillery in the middle east – too minor perhaps. Thanks for this comment. I should have entries on Ransome up by the end of the day, and I will look into Crawshay-Williams (of whom I had not heard) as soon as I can. Thank you! I don’t know how much attention you want to pay to writers of weird fiction and ghost stories. H. Russell Wakefield was in the Royal Scots Fusilers and served in France and Macedonia. According to the wiki article on him, he suggested to the British government use Chinese laborers on the Western Front. He was born in Elham, Kent. I don’t think it’s quite accurate to say that John Buchan ‘failed his physical’: he was 39 when the war began (and when he wrote The Thirty-Nine Steps), so was already over-age! Despite being ill for most of the war, he outwrote everyone else, as a journalist, historian, propagandist and novelist. He began work for the War Office under Haig in June 1916 (which isn’t ‘Intelligence’), and became Director of Information in January 1917 (which is also not ‘Intelligence’, but propaganda, though he would have had access to Intelligence reports. But otherwise, thanks for including him! I will make the necessary adjustments here too: thanks! I am not sure where I got the “failing his physical’ from: I shall check my notes. And yes, he was 39, and 38 was the maximum age for recruitment, so you are quite right. (I think I had been thinking it was 40 rather than 38.) Thanks for reading it! I think we are being confused here by a presumption that you have to be young enough to be called up to fail your physical. Buchan was certainly over-age, but this did not stop him wishing to enlist (examples of writers who managed to do so though overage include H H MUNRO (SAKI), born 1870). Continuing the Buchan discussion 18 months later … Buchan was ill on and off during the war, but was also phenomenally productive as a writer, editor and journalist, and publisher, travelling between London and Edinburgh frequently, as well as to France as a war correspondent a couple of times, giving public speeches. I don’t think the ODNB entry is accurate for the war years, mainly because very few people have done much research on that period in his life, and so errors from earlier sources get repeated without checking. His sf / weird fiction was largely prewar and postwar. Although ‘Basilissa’ was published in 1914 in Blackwoods, it had appeared in 1913 first. The composition date of his really very weird story ‘The Shut Door’ (published 1926 & 1930) is not known, but its subject, wartime ending and style suggest that it might possibly be a wartime draft that he worked up much later. Totally different discussion: Alice Brown should be listed in this site. Mike Ashley’s The Feminine Future. Early Science Fiction by Women Writers (2015 Dover Thrift Editions) contains her story ‘The Flying Teuton’ which is definitely WW1 sf. Dornford Yates (Cecil Mercer) could also be listed here. He served in the war but was invalided out with chronic rheumatism. His linked story collection The Courts of Idleness (1920) contains stories originally published before and during WW1, linked with a time-slipping wartime episode of extreme spookiness. His novels Anthony Lyveden (1921) and Valerie French (1923) contain a murderous hypnotic Gothic wood, and a rather good ghost story. Several other outbreaks of weirdness occur in his fiction, principally The Stolen March (1926) (travellers walk into fairy-tale country between French and Spanish borders and have to fight hard to be allowed to escape since the characters therein are determined they will not leave alive).